At Styles of Elegance, we take hair design to new lengths! Using natural human hair, Shirin and her talented staff can give you the length and fullness you've always dreamed of. Beauty pagent contestants and models utilize this unique service at Styles of Elegance, and come out looking like winners every time! No matter what your ethnicity or type of hair, Styles of Elegance can show you off like you've never been seen before. Take your hair to any length you desire, in the matter of just one sitting. You'll look like a different person when you leave the Salon... A new you is waiting to be discovered, free consultation! 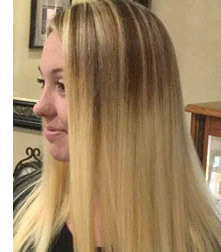 Blond me Blond, the latest european color ~ the perfect hair color for you can be found at Styles of Elegance! Whether you're interested in totally changing your color for a whole new look, or just enhancing your natural color, we have the solution that's just right for you. Schwarzkopf Professional salon exclusive hair products and services. Keratin is a revolutionary keratin based hair treatment. Keratin is the primary source of protein of the skin, hair and nails. This natural substance gives the hair the ability to return to its original healthy, shiny, smooth state. Results are visible immediately after treatment is completed, and clients are amazed to say the least. Hair looks healthy and youthful. The results last two to four months, it fades progressively with every wash. As hair is treated every few months or so, you will be able to observe the improved quality of hair grown after Keratin was applied. Keratin is available in "Formaldehyde Free" keratin hair treatments.